Save the Date for Our Halloween Party in The Oaks at Fenton Mill! 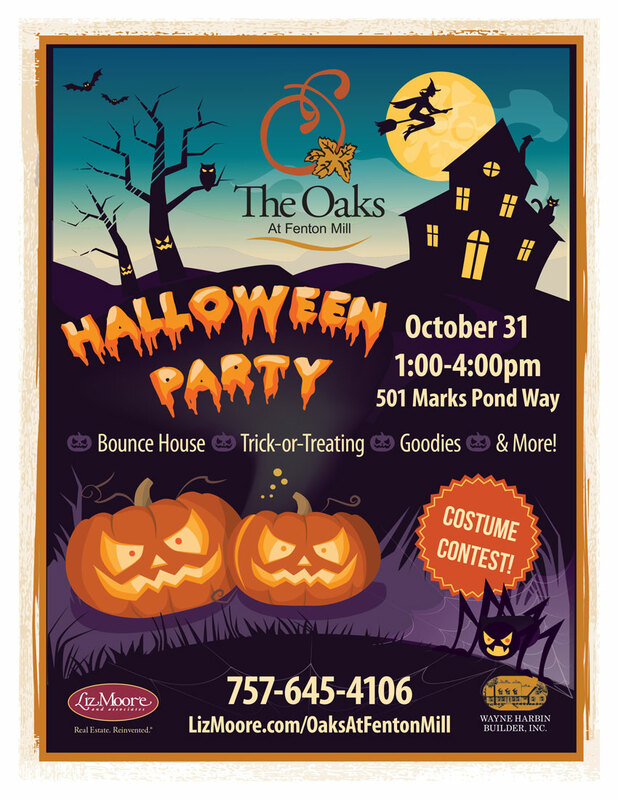 Join us for a Halloween Party in the Oaks at Fenton Mill on October 31st from 1-4pm at 501 Marks Pond Way. Bring the kids out for trick-or-treating, costume contest, bounce house fun, and more! Tucked away in a serene community of rolling woods, spacious half to two acre home sites, and a sprawling recreational area for residents, the Oaks at Fenton Mill is one of Williamsburg’s best kept secrets. Residents at here enjoy walking trails, soccer fields, their own picnic pavilion, a playground, and a “look out” over the lake and fountain. Schools serving the community are Waller Mill elementary, Queens Lake middle, and Bruton High School. For more information, email us at info@lizmoore.com, or visit www.lizmoore.com/oaksatfentonmill.